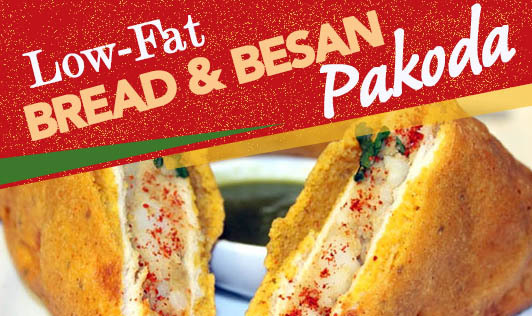 Enjoy the monsoons with this delicious low-calorie version of bread & besan pakodas. • Mix channa flour, chopped onions, coriander, and green chili in a bowl, add enough water and mix it all together to make a thin batter. • Season the batter with salt and keep aside. • Cut the bread slices into triangles. • Heat a nonstick tawa or pan and drizzle some oil on it. • Now dip each bread triangle in the batter and toast it on the tawa until golden brown on both sides. Make sure you press the bread slices while cooking so that they are cooked evenly on all sides. • Serve hot with some ketchup.